This week has been a busy one, I have lots on my mind, and lots I want to write about. For now, here’s a summary of our exciting lives. Saturday was Kris’s 31st birthday and the day my family (Mom, Dad, Liv, and Matthew) would be arriving at our house to spend Easter with us…well, mostly to see Jennika, but Easter was a good excuse. We decided to get up and go for a nice hike before our company arrived. Kris used one of his gifts (a hiking guide book) to find a suitable hike for us, I bundled up Jennika, and we were off. The hike we selected followed a creek up to an old mining cave. We however, didn’t reach the cave because about a quarter of a mile into the hike we encountered a moose! We gave him (0r her?) lots of space and slowly hiked further as he ran further up the trail. Eventually, however he decided he didn’t like this game and just stopped about 50 feet from the trail. We’ve heard plenty of stories about how dangerous moose are and didn’t want to risk aggravating our friend. So we attempted to go up and around our large furry road block by scrambling off trail. Unfortunately we couldn’t find the trail again once we got past the moose so we decided to head back to the car and find another, safer trail. We drove about a mile up the road and started another beautiful hike in Big Cottonwood Canyon. We had hiked maybe a half mile when I started seeing recent signs of moose. I wanted to warn Kris, who carried Jennika in a front pack, to keep an eye out for moose but thought to myself that I was being silly. After-all what is the likelihood that we’d encounter two different moose on two separate hikes? So I kept quiet, fearing Kris would think I was being ridiculous, and we continued on. The further we got, however, the more I saw that convinced me that we were indeed behind another moose. So finally I did mention it to Kris and he said he’s be watchful. After hiking another 5 minutes we came upon a large older moose, standing about 100 yards ahead of us on the trail….staring at us. We both quickly backed down the trail to give the moose lots of room. He looked tired and a little desperate. I think we’d been chasing him for a while and he was tired of running and ready to face his pursers. So once again we turned back. As we headed back to the car I told Kris how sorry I was that we didn’t get to complete a hike. Both he and I weren’t very sorry though. It was a little annoying to be turned away by a moose, but way cooler to just get to view such a large and amazing creature in its own setting. That in itself was a pretty cool birthday present for Kris. On Sunday we attended church, an amazing experience that I hope to write about soon. Then we feasted on a wonderful Easter diner together. That afternoon my family drove back home and I took Kris to the airport because he had business meetings in San Jose early the next week. Monday and Tuesday Jennika and I were on our own. Let me just say that I have a great deal of respect for single moms. It’s tough being on your own with a little one! Wednesday afternoon Bill and Karen (Kris’s parents) arrived from Oregon. They came to see Jennika…and us….but mostly Jennika. 🙂 Wednesday evening Kris flew home and we had a happy and full house again. I have to pause here for a second and say that I have the absolute best in-laws that a girl could ask for. When I listen to my girlfriends complain about the comments their mother-in-laws make, or the irritating habits and demands of their husband’s family I simply cannot relate. I have been blessed with another mother and father who really do treat me like their daughter, continually bless Kris and I, never criticize us, and are always willing to help us in whatever way possible be it prayer, babysitting, or swinging a hammer. I love it when they come to visit because I know that we’ll get a lot done and we’ll be adored and blessed. So, having said that, you can easily imagine that our next two days were spent enjoying being together and working on home improvement projects. Bill and I made at least 4 trips to Home Depot in a 24 hour period. I love that store! We rented a rototiller and Bill broke up the dirt in my garden. We also purchased three trees; two Aspen and one Pear, and planted them. I also now have sheeky new light fixtures in my kitchen. They were delighted with Jennika and spend nearly every one of her waking hours holding or playing with her. I know that she felt well loved! Good job Oma and Papa! Early Saturday morning, despite our best efforts to convince them to stay longer, Bill and Karen started the long drive back to Oregon. We were sad to see them go so soon. That afternoon we decided to take advantage of the beautiful sunny and warm weather and go for another hike. It’d been a full week since our last hike, which is a really, really long time for us. So we decided to hike up the the first hamongog (Hebrew term for meadow) on the trail up to Lone Peak. 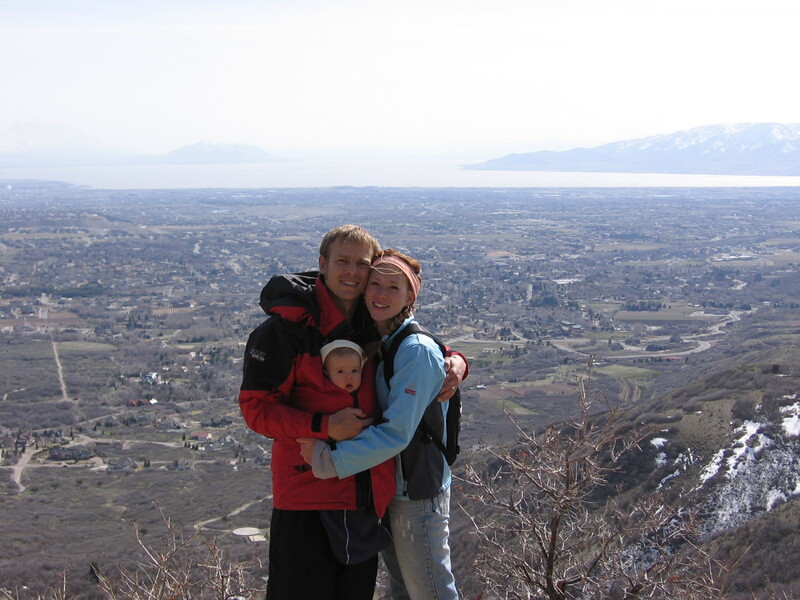 This summer we hope to actually climb Lone Peak so this was a good preparatory hike. The hike was beautiful providing great views of Lake Utah on the way up and a beautiful snowy field with Lone Peak in the background at our final destination. We saw lots of signs of moose on the trail, which made me a little bit nervous, but we never encountered more than a lizard and several very stupid mule deer. And so that brings us up to date. It’s Saturday evening and we’re sitting in our warm and peaceful house with the lights off to observe Earth Hour Day. Hope your week was full of fun, love, and adventure too! Is she sleeping in that first picture? Lol! Love it! 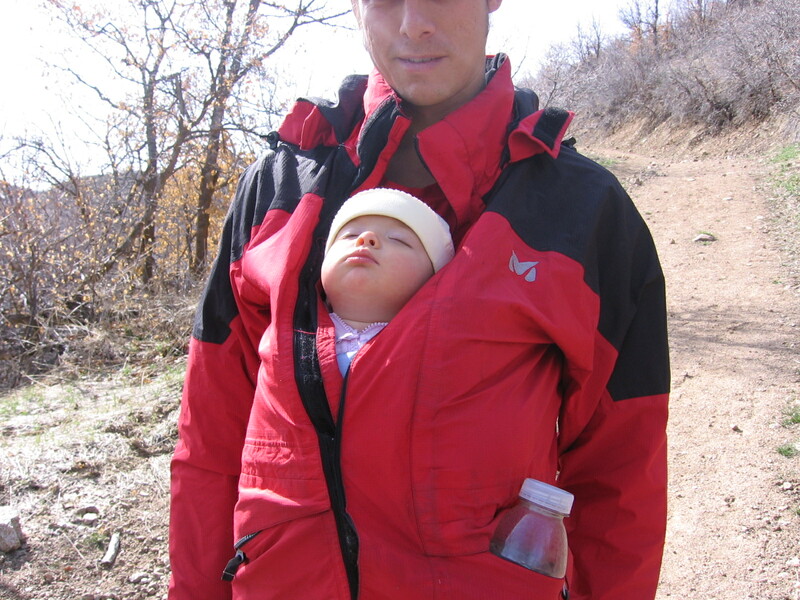 I LOVE the pic of her sleeping in Kris’ jacket.. she is completely comfortable being hauled around wherever the two of you decide the adventure is to be for the day! Good job!